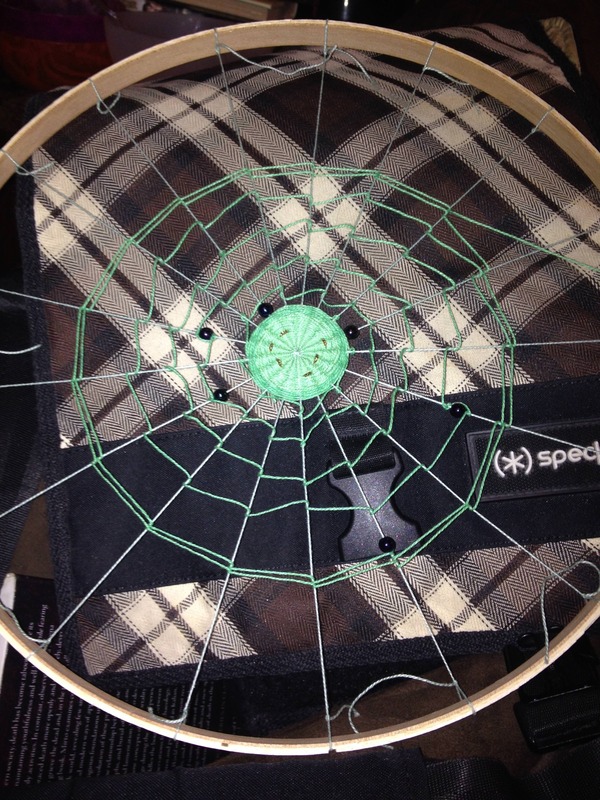 Weaving spiderwebs came up in one of my communities, so I said I'd do a how-to on weaving circles and spiderwebs. These have lots of magical uses. Spirits traps, woven wards, homes for spirit spiders, and anything else you might come up with. This post is just for the physical aspect. 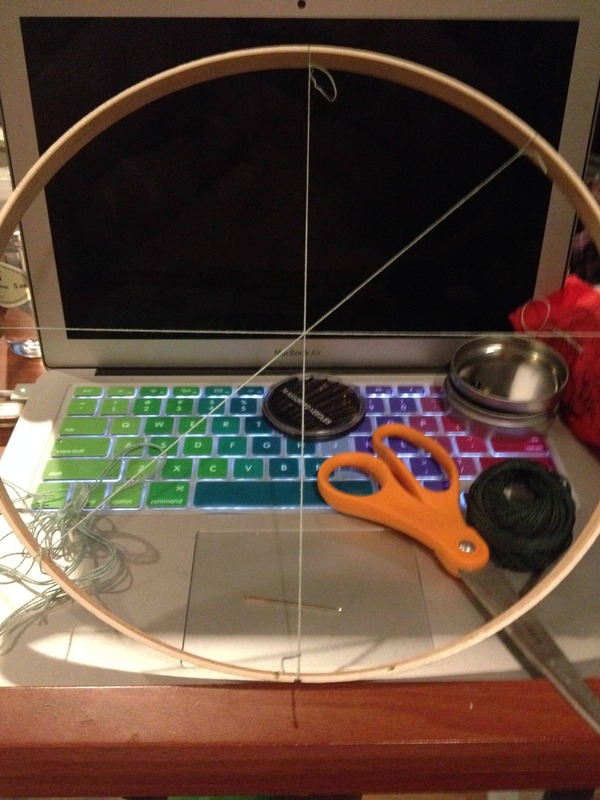 Now, there are round looms (Majacraft makes them) for round weaving, but they start at nearly $40, which is money I don't have, so I use embroidery hoops. 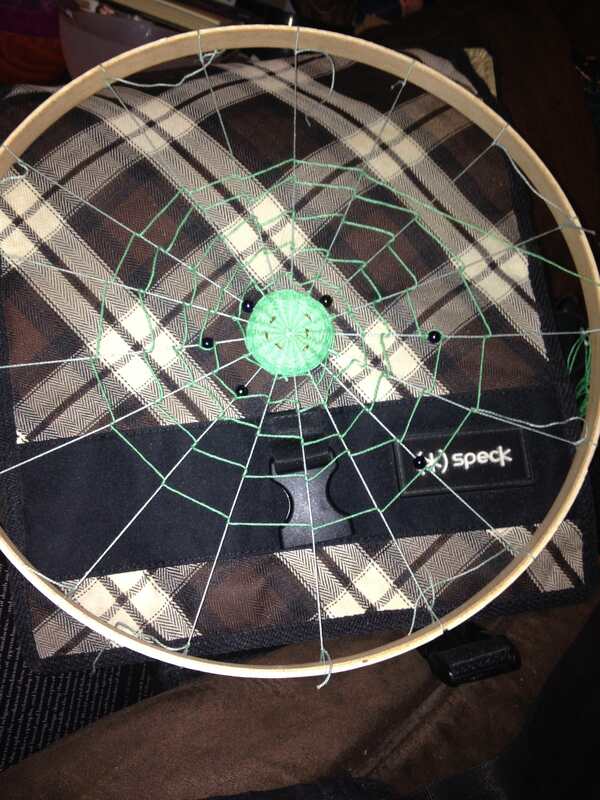 If you use an embroidery hoop the way I show here, you can't remove the weaving from it. It has to stay. But embroidery hoops are cheap. I used a 12" one I had lying around. 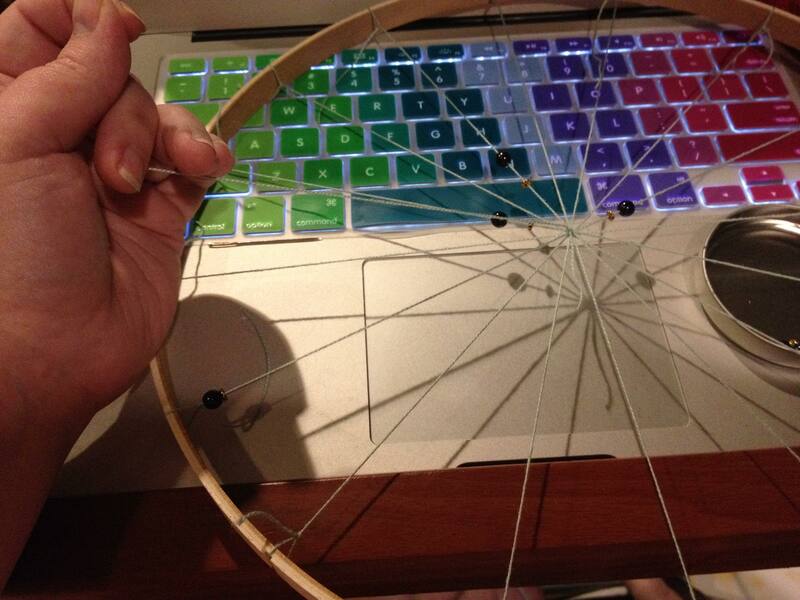 You want the inner hoop, you don't need the outer. 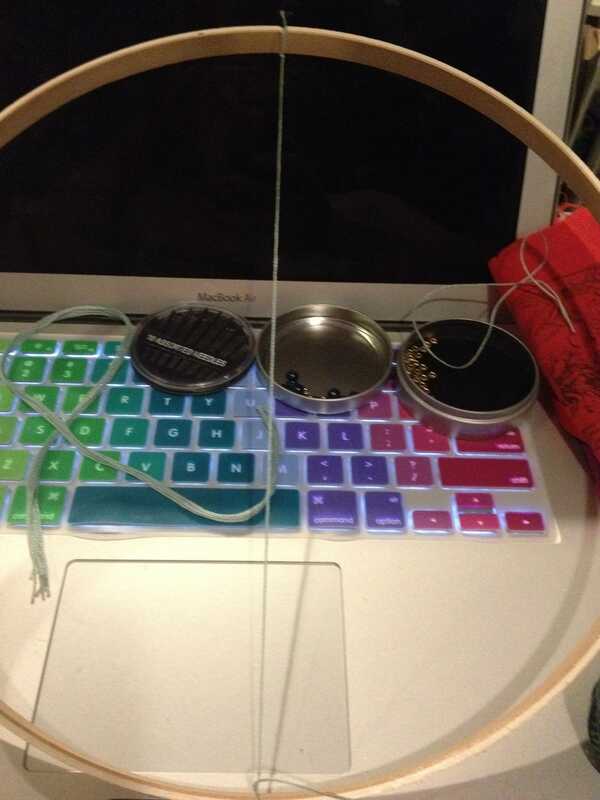 You will also need yarn or string and scissors. For beads I have here some tiny gold rondelle spacers, and some larger Czech glass rounds. You might also want needles, beads, and a small shuttle (not pictures). Measure off an even number -- for convenience, make it a power of 2, such as 8 or 16, I'll show you why in a minute -- of lengths of thread that are 3-4" longer than the diameter of the circle, and 1 length that is 3" longer than the radius, or a little longer than half the length of the other threads. I used 8 diameter pieces. 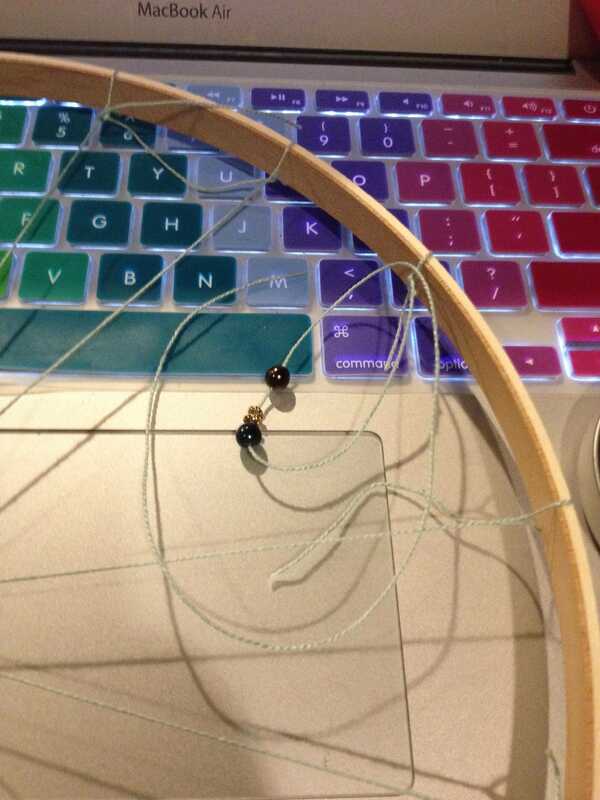 Now, take your first length of thread and tie it to the hoop. I had a little notch in mine, so I started there. 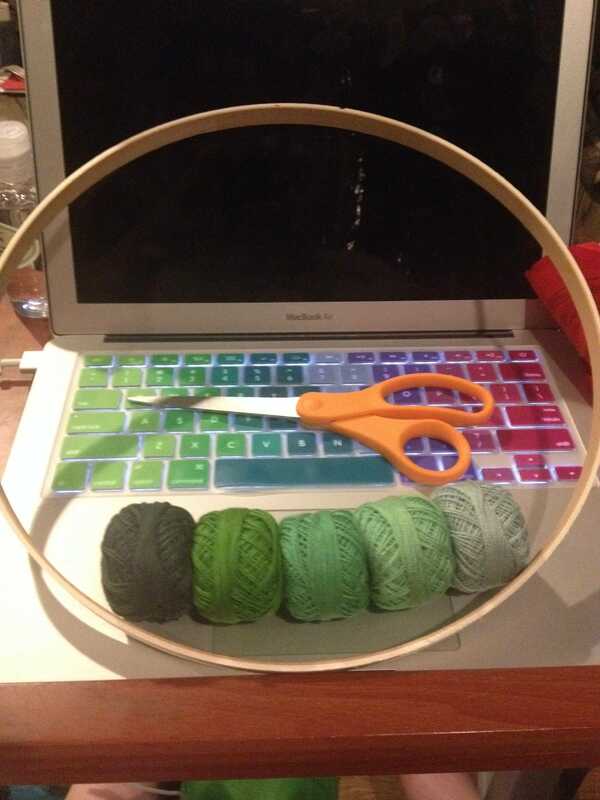 Expect to leave some space in the loop around the hoop, not to snug it down tightly. 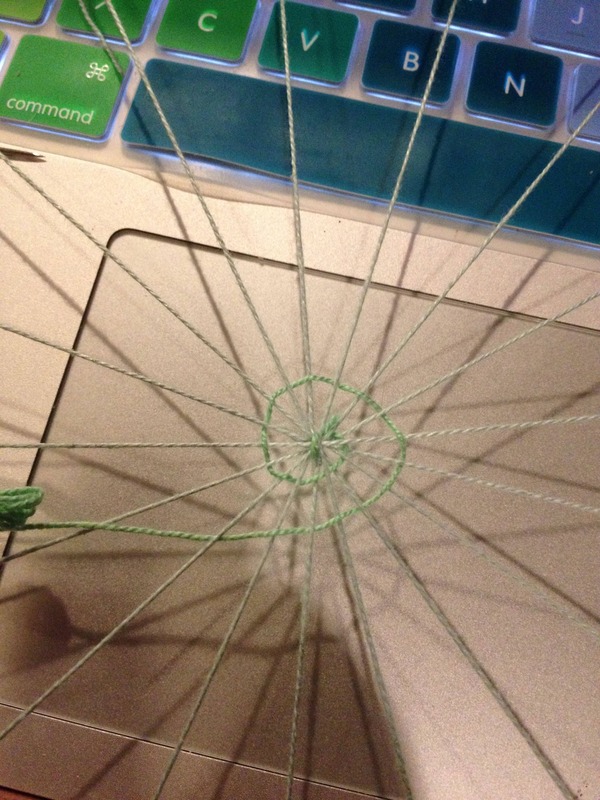 Cross the circle with the thread, as close to across the middle as you can, and tie the other end. 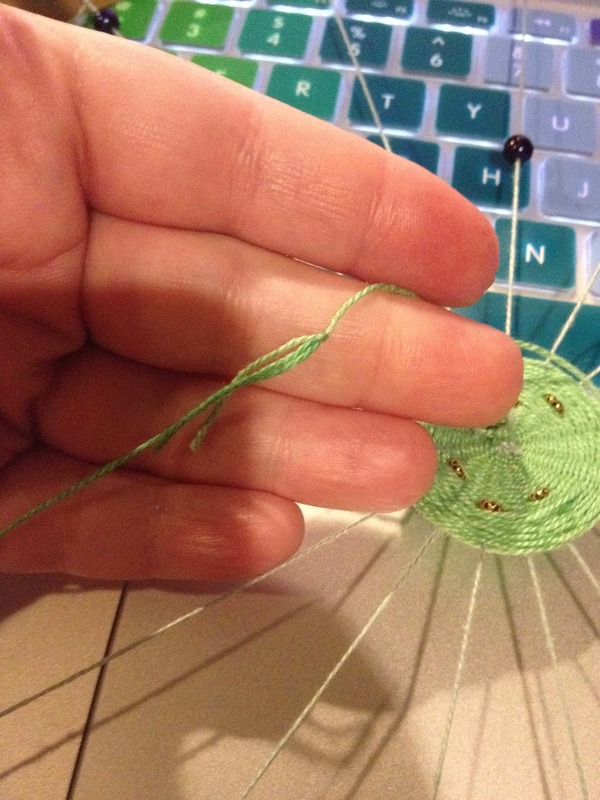 Don't put so much tension on it that you warp the hoop, but try to keep some tension. Tie the second across the middle at right angles to the first. With the third and fourth, bisect those right angles. This is where the niftiness of using a power of 2 comes in. No fiddling around trying to do a third of the space, all you have to do is keep bisecting the previous angles! 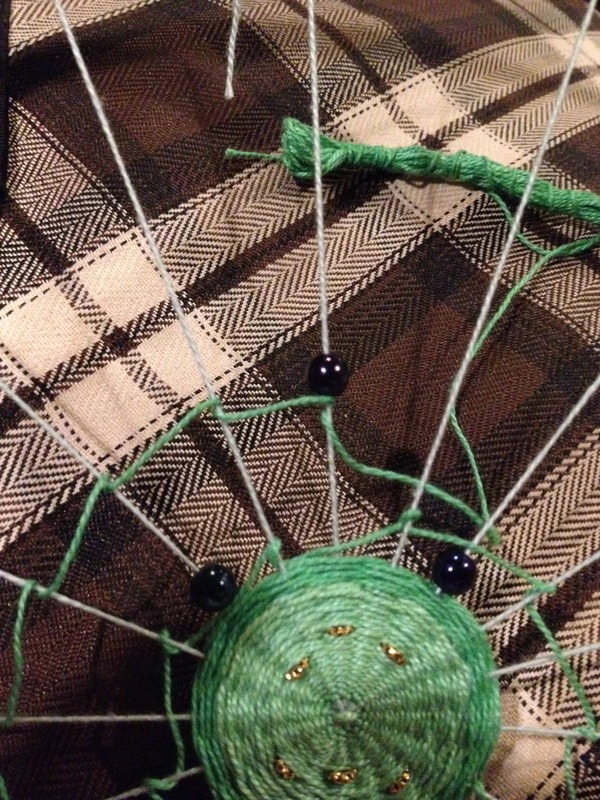 Now, if you want some beads on your radial warps, you should add them before you tie the warps on, which I totally forgot to do until this point. So now I added some. 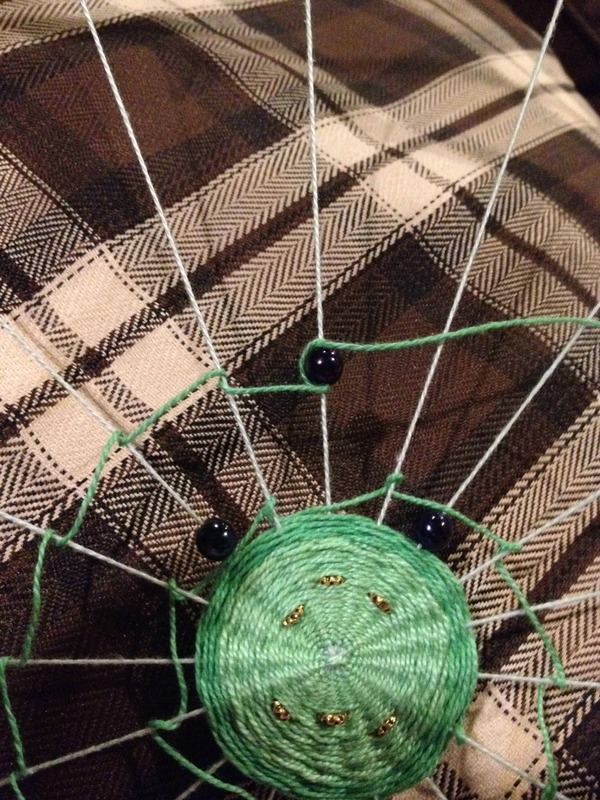 I decided I would want the same beads on either side of the center, so they're arranged symmetrically (sort of). 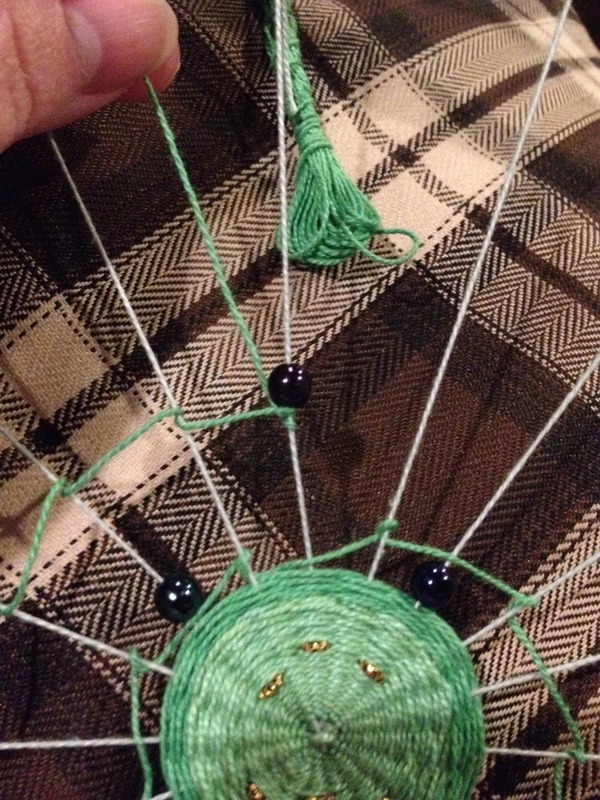 You really want small beads towards the center and large beads farther out, so I did Czech-rondelle-rondelle-Czech. If you want to add them to the warps as well, you can do that. I did not. They should all cross at the same point right now. If they don't, nudge them around until they do. There's a problem, though, because an even number of radial warps means there's no alternation. 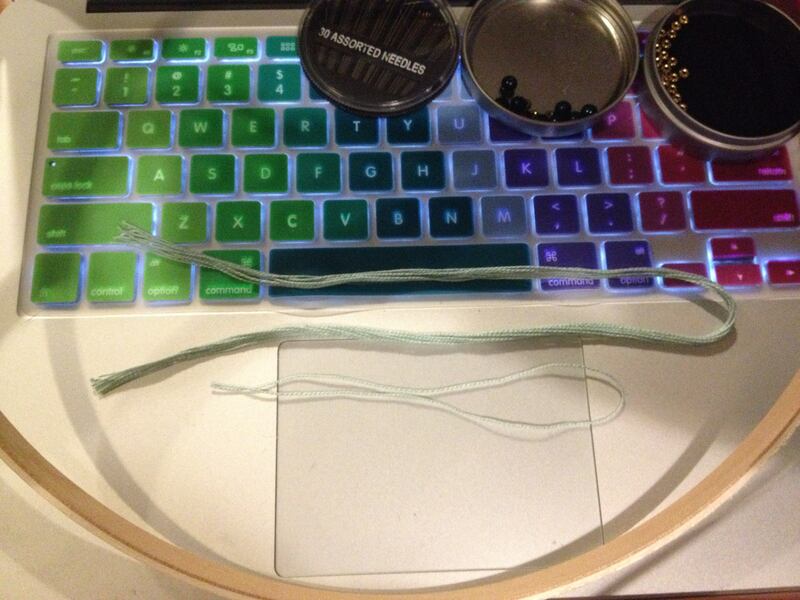 The weft will always go over the same thread, and under the same thread, unless you intentionally throw in floats. So you add an extra radial. 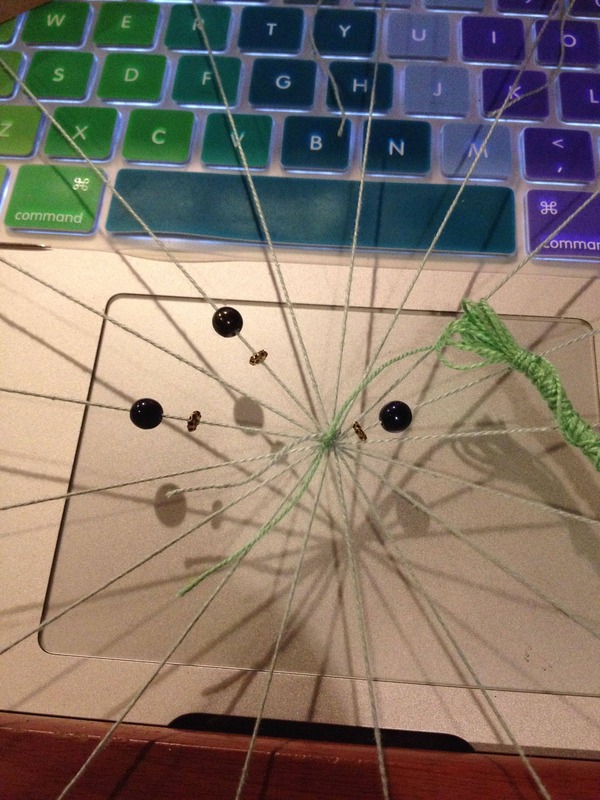 Tie the radial so that it goes around all the other warp threads at the center. Tie a nice tight square knot. The side with the loose end will be the back of the weaving. 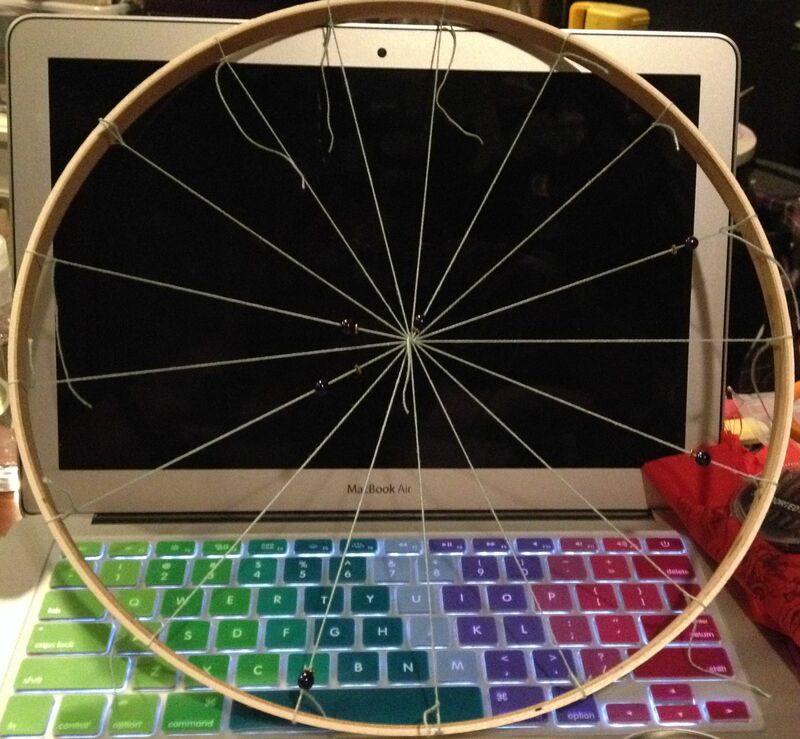 Then tie the other end to the hoop so that it's halfway between two other warps. If you had a notch in the hoop and used it, put it next to the notch. Now, you'll notice that this means that these three warps are closer together than the rest. Time to fix that. Just scootch the knots around, starting with those closest to the half-length warp. Don't worry about them being exact, just do your best. On the back side -- the side where the loose end from the last warp is -- tie your weft on the same way you did that warp. 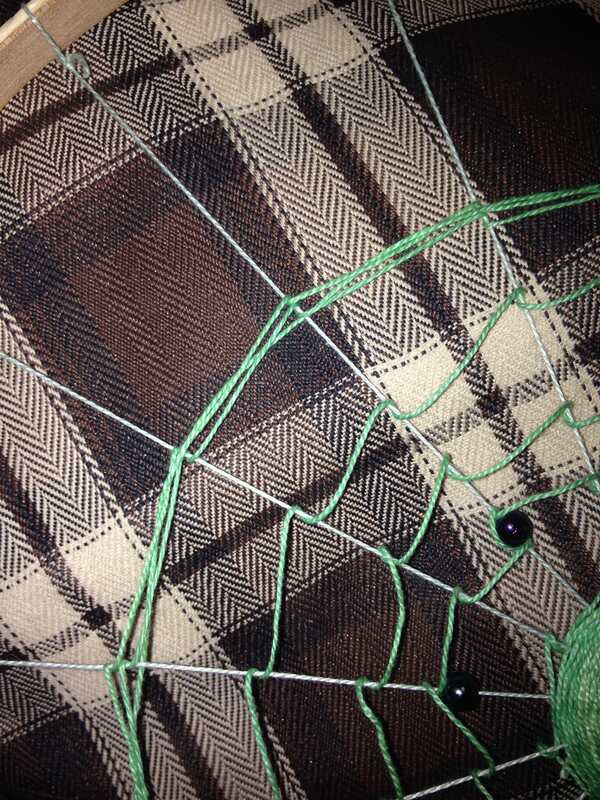 Pick a gap, pass your weft through, and start weaving over and under. Go ahead and let it lie loose until you've made a full circle, and then pull it snug. Then keep going, just going over and under and pulling in snugly. Slide your beads in wherever you like, and just keep weaving around them. 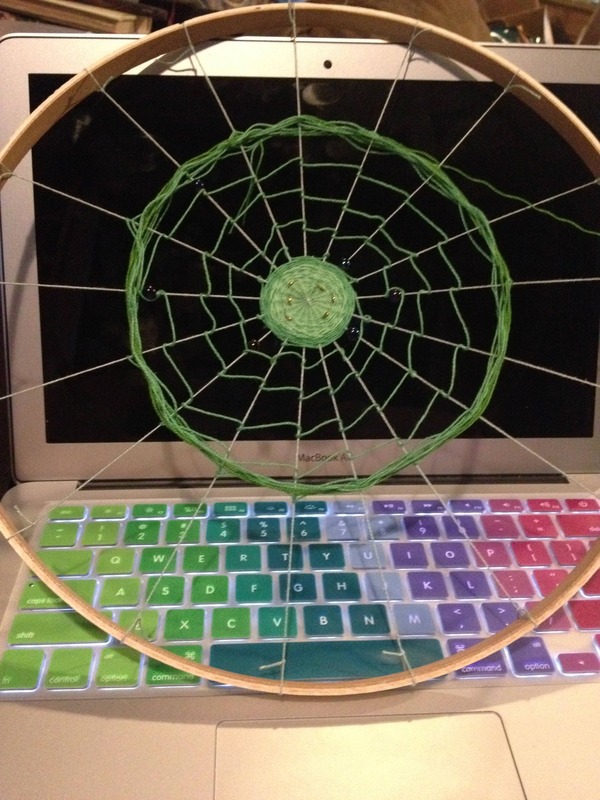 When you get to the point of wanting to change colors, or just of needing to add a new weft thread, tie a weaver's knot (a href="https://www.youtube.com/watch?v=Jl5ZxeR27DM">instructional video), and keep going. Try to locate the knot at a point where the thread goes under a warp, and keep the loose ends on the back of the weaving. 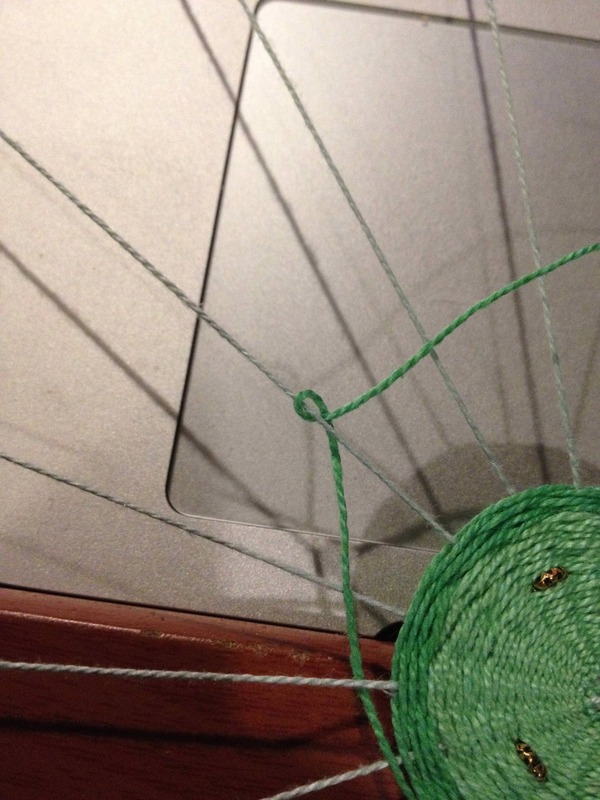 One of the good things about a weaver's knot is that you can trim them quite close. And now we're going to switch to a spiderweb style. 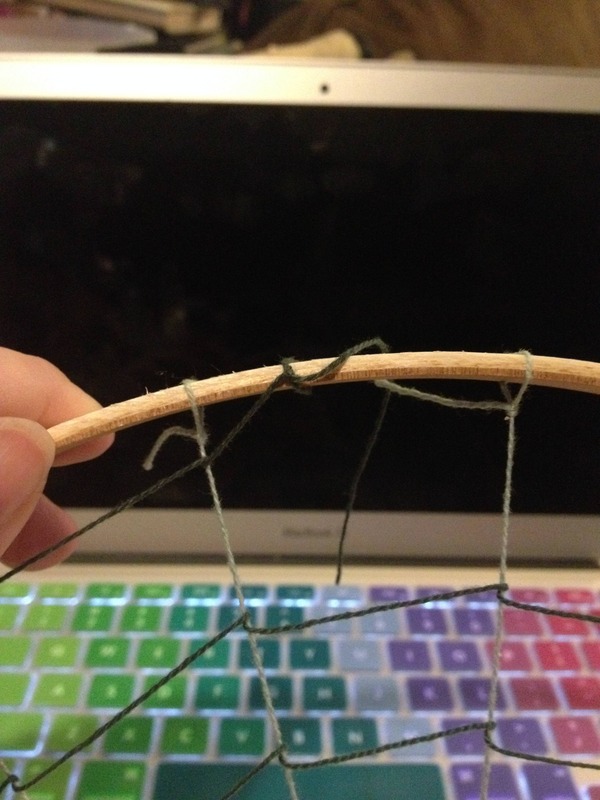 While you certainly can tie a half-hitch knot around the warps, I find it easier to just loop. You can loop around from the front or the back, but it's important that the outgoing line of the loop goes below the incoming line. If it goes over, it'll just unwind as you move on and not give the effect you want. 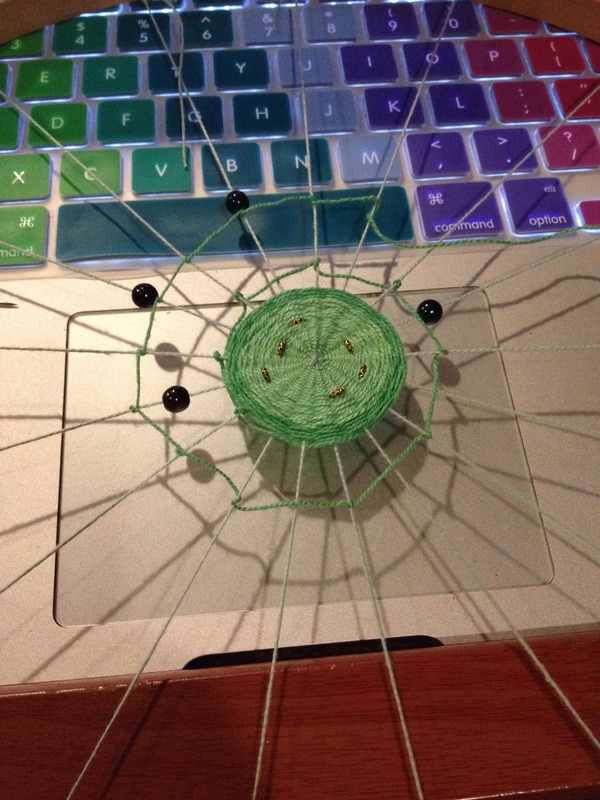 Close in, you can skip every other warp thread if you want to, but as you move out, you'll need to wrap every one. Spiral your way out, as fast or as slow as you like. 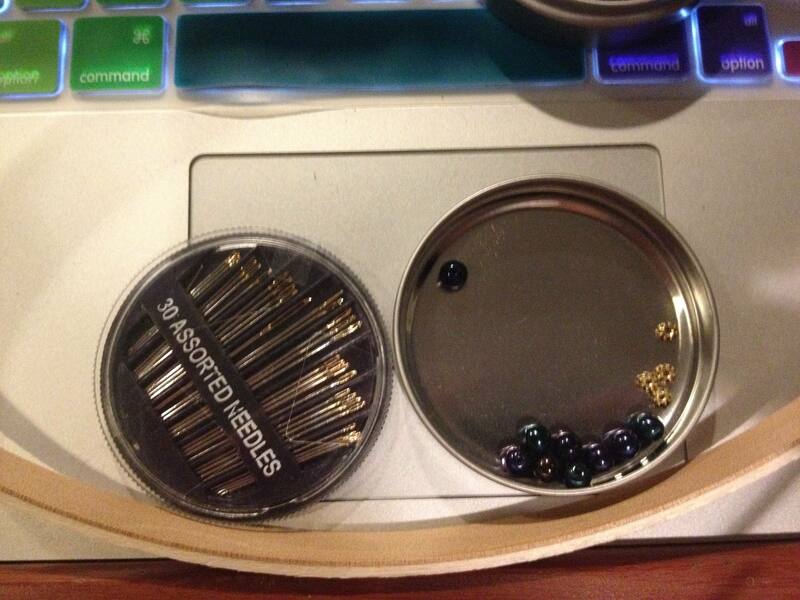 This is a good place to start putting large beads in. You can let them travel freely between loops, or you can trap them within a loop. 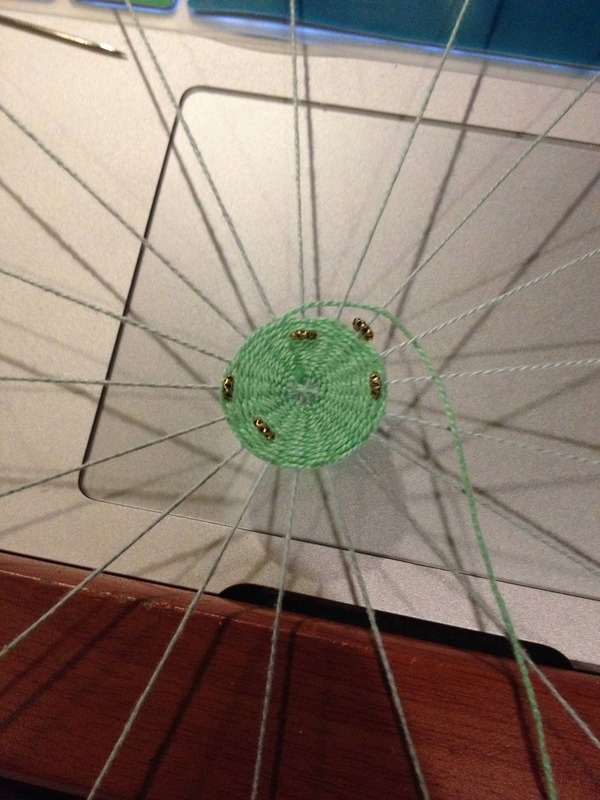 To trap a bead within a loop, first make a regular loop like you've been doing, and slide the bead right up next to it. 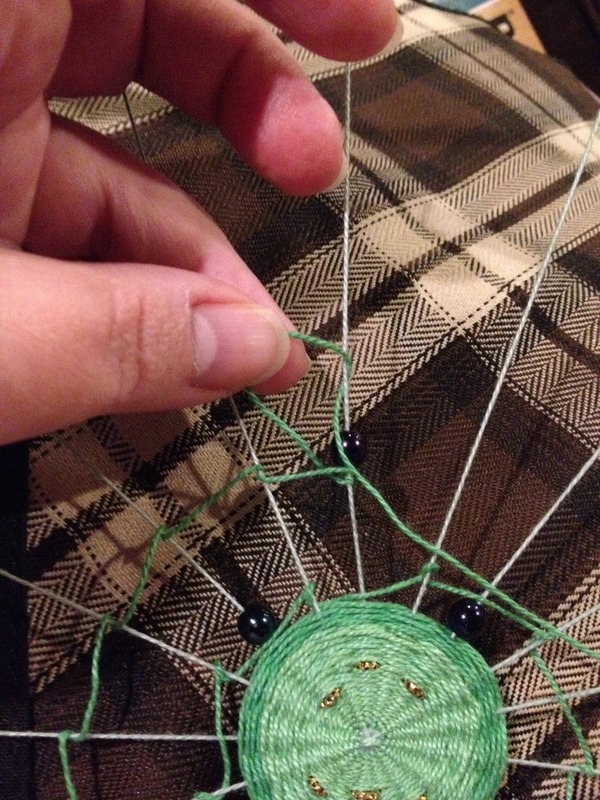 Pass the weft behind the bead, and create another loop above it. At some point, you may wish to go back to a plain weave. Stop spiraling and go around in a circle, getting close to the point at which you stopped spiraling. 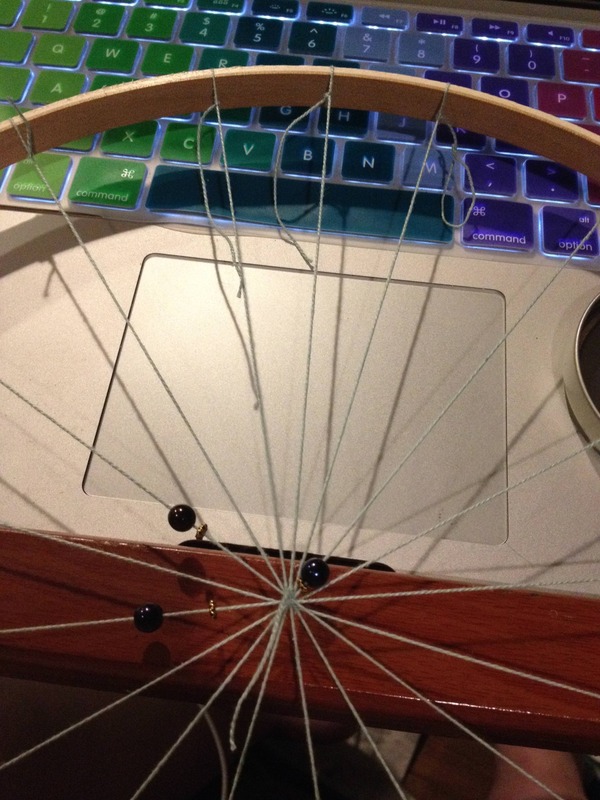 Build a second looping circle on top of the first one, to give yourself some solidity. Go back to plain weaving. It'll interact a little oddly with the web part at first. That's ok. 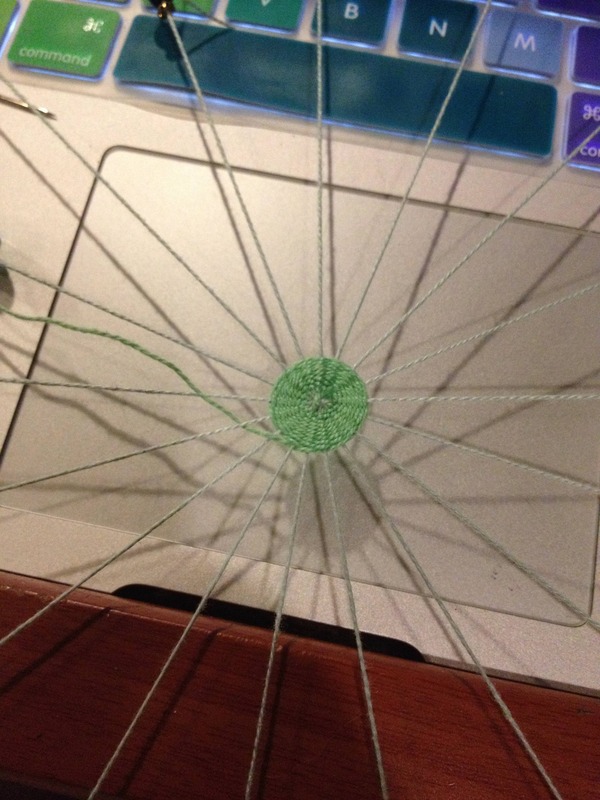 If you use fine thread this far out from the center, it'll get loose and kinda messy looking, although I like the result. Or you can switch to a heavier yarn. 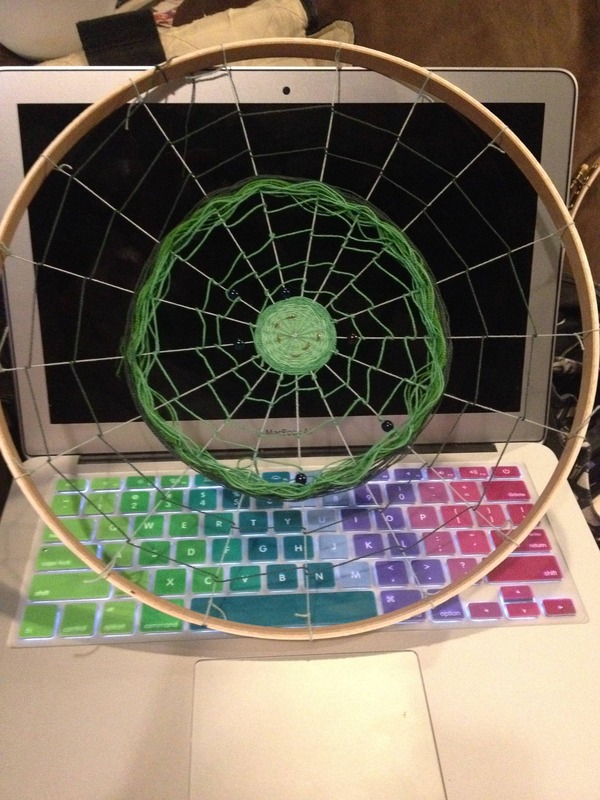 When you get to the edge, just anchor your weft to the hoop. This took me maybe three hours total, including all the photography. 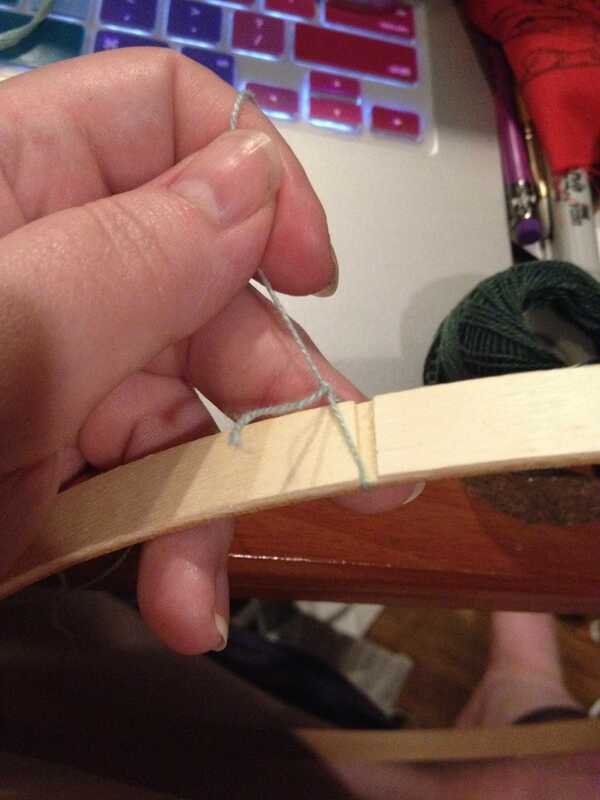 This particularly weaving is not very sturdy, because i stuck with fine thread while weaving where the warps were farther apart. But for hanging on a wall or something, it's ok. 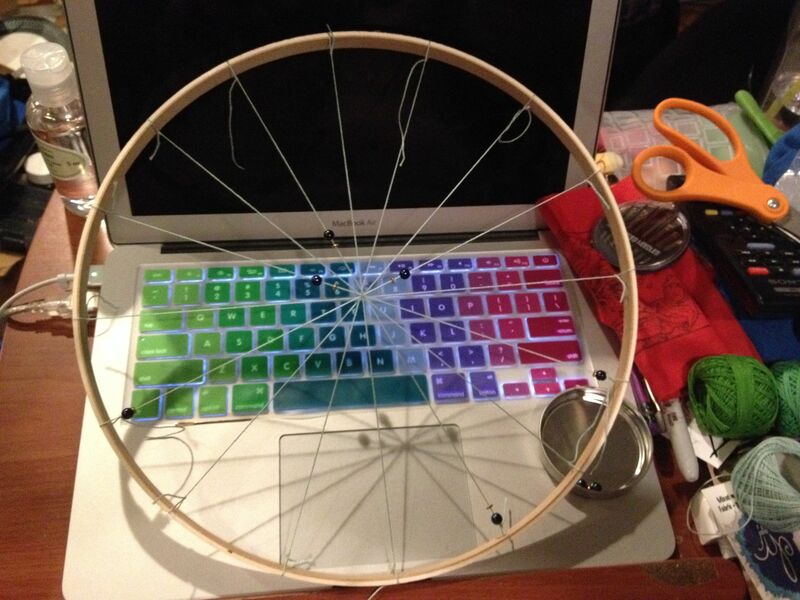 If you're interested in more ideas for round weaving, check out the Majacraft guide to their round looms.